This table consists of a fine quality solid mahogany top with low moulding to the back edge (this was to stop items falling from the back). 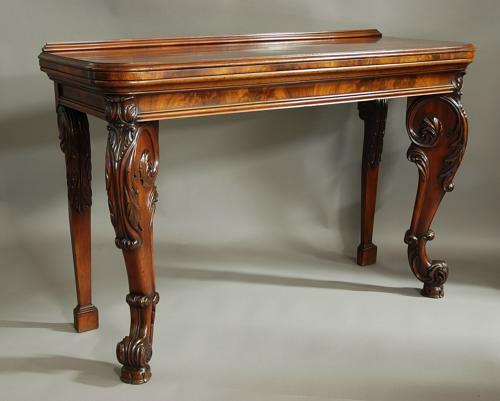 The top has rounded corners with a moulded edge and a finely figured cross grain frieze leading down to a further moulded edge supported by a finely figured mahogany rail with superbly carved corners following down to the front legs. The imposing front legs are of cabriole design with superbly carved scrolling stylised acanthus decoration leading down to a scroll foot again carved with acanthus and terminating with a tulip style carved support. The back legs, of sophisticated design, consist of a scrolled stylised acanthus design to the top tapering down to a square block foot. The back legs have been cleverly designed to allow them to fit over a skirting board and therefore allowing the tops to fit closely to the wall. This table is in excellent original condition, is of stable construction and can go straight into a home.